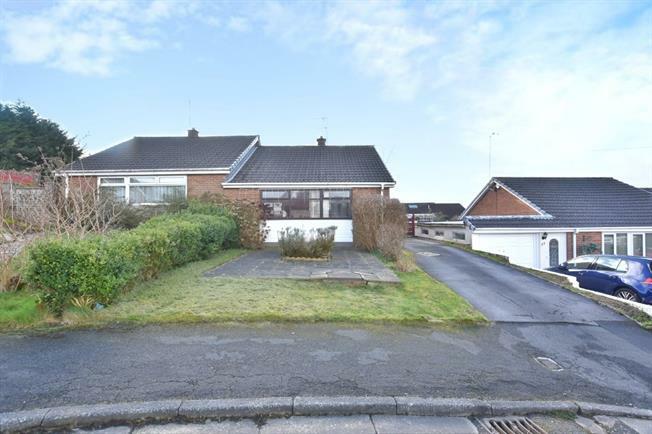 2 Bedroom Semi Detached Bungalow For Sale in Blackburn for Asking Price £110,000. The property comprises an entrance hallway with access to two bedrooms at the front, a three piece bathroom and the lounge at the rear overlooking the garden. Accessed through the lounge is the built in kitchen with access to the rear garden which is well maintained and quite low maintenance. Externally there is a multi car driveway, a detatched garage and gardens at the front and rear. Call us on 01254 678935 fro further information and to arrange a viewing. UPVC front door. Laminate flooring, built-in storage cupboard, ceiling light. Double glazed wooden window facing the rear overlooking the garden. Radiator, carpeted flooring, ceiling light. UPVC back door. Double glazed wood window facing the rear overlooking the garden. Vinyl flooring, ceiling light. Roll edge work surface, built-in wall and base units, space for oven, integrated gas hob, over hob extractor, space for fridge freezer. Double bedroom; double glazed wood window facing the front. Radiator, carpeted flooring, a built-in wardrobe, ceiling light. Double glazed wood window facing the front. Radiator, laminate flooring, ceiling light. Single glazed wood window facing the side. Radiator, tiled flooring, built-in storage cupboard, tiled walls, ceiling light. Standard WC, panelled bath, shower over bath, pedestal sink.